A US jury has found that internet giant Google breached copyright in a case brought by Oracle over its Java programming language. But the jurors were unable to agree on whether Google's actions constituted "fair use" under copyright law. 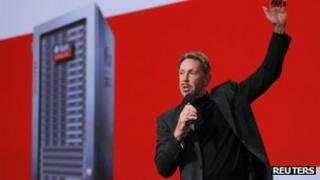 Oracle was asking for $1bn (£630m) in compensation in one of the biggest such technology lawsuits to date. The language is used by many business applications as well as other software, such as the video game Minecraft. The jury in San Francisco were asked to consider four questions on Oracle's claim that Google violated several of its patents and copyrights, but could only agree on three. It found in Google's favour on two of them. Google was found to have infringed Oracle's copyright on nine lines of Java code that is in Android, its mobile operating system. But Oracle can only seek statutory damages, ranging from $200 to $150,000. Google is asking for a mistrial to be declared. "There has been zero finding of liability on any copyright so far," US District Court Judge William Alsup told lawyers for both firms after the jury left. "The affirmative defence of fair use is still in play." The same jury will now hear evidence in the next phase of the trial, covering Oracle's allegations that Android violates two Java patents. Oracle claimed Google's Android system infringes intellectual property rights relating to the programming language. The case did not centre on Google's use of Java itself - which is free for anyone to use without licence - but rather the Android-maker's use of 37 application programming interfaces (APIs) that allow developers to write Java-compatible code. Oracle argued that by using its intellectual property, and then giving Android away for free, Google undermined the possibility of it licensing Java to mobile phone makers.